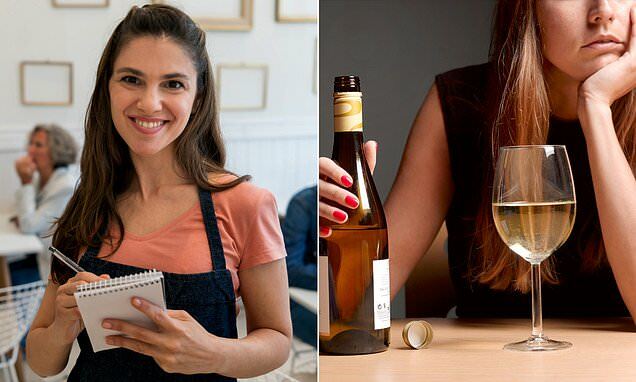 A new study published in March suggests that employees faking smiles on the job in certain industries could be driving them to drink. Alicia Grandey, professor of psychology and a study co-author, believes the research should lead some employers to avoid 'service with a smile' type policies. The paper published in the Journal of Occupational Health Psychology by researchers at Penn State and the University of Buffalo, suggests drinking habits can be predicted by the amount of 'emotional labor' a worker may have to do. 'Faking and suppressing emotions with customers was related to drinking beyond the stress of the job or feeling negatively,' Grandey said through Penn State News. Participants were asked how often they faked or suppressed emotions, also known as 'surface acting,' at work, and how often and how much they would drink afterwards.